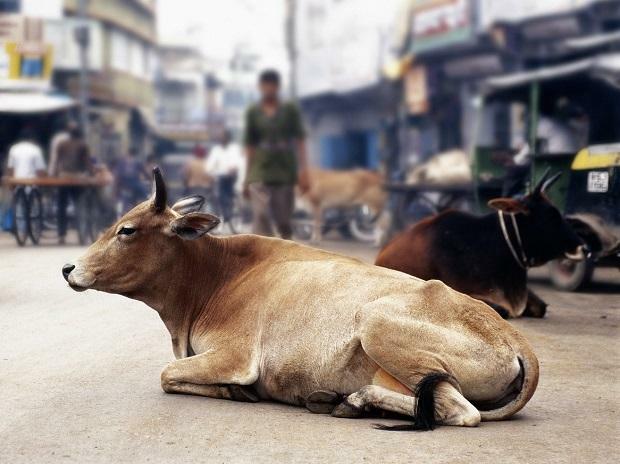 In a bid to curb the menace of stray cattle, mostly cows, roaming on the city streets, the Surat Municipal Corporation (SMC) has developed a system of ear-tagging such animals and linking it with the Aadhaar number of their owners. Each ear tag carries a Cattle Registration Number (CRN) that is linked with the Aadhaar number of the cattle owner. It helps the SMC to identify, trace and penalise the owners for letting their cattle wander on the streets and cause inconvenience to people and traffic, he said. The civic body has so far pinned plastic tags with serial numbers to the ears of around 25,000 stray animals across the city and linked them with the Aadhaar numbers of around 1,500 cattle owners, Market Superintendent of SMC, Dr Praful Mehta, said. "We have created a computerised database of around 25,000 such stray animals belonging to around 1,500 people. The CRN is linked with the Aadhaar number of the owners. Since the city limits have expanded, this nuisance has grown. I think we are yet to register another 25,000 such stray cattle," Mehta said. He said that using the number tagged on the ears of the bovines, the civic authorities can trace their owners easily, as the latter's phone number and address are registered in the database. "Cattle owners do not come to us voluntarily to get their animals ear-tagged. Therefore, whenever we catch a stray animal, we ear-tag it and give a CRN. Then, when the owner comes to collect his cattle, we register his details and link it with the CRN. If he does not have Aadhaar, we use other documents, such as the driving licence," Mehta said. "When the same tagged animal is caught again, we can trace the owner. Since the owners usually do not reveal the exact number of the cattle they own, we can trace his location using the database find out the exact number of animals in his possession. We then compel him to ear tag all those animals before releasing the impounded ones," he said. Presently, the corporation impounds average 70 stray cattle each day from different parts of the city. The SMC imposes a fine of Rs 1,800 for the first day - Rs 200 for the ear tagging of each impounded bovine, Rs 1,000 towards cattle impound fee (one time charge), and Rs 650 each day towards administrative and maintenance charges, the official said. The Police also book the owners under IPC section 289 (negligent conduct with respect to animals) and section 90 (a) of the Bombay Police Act, which deals with penalty for allowing their cattle to stray on the streets. According to Mehta, this system was launched recently and it would eventually deter the cattle owners from letting their cows and other animals from straying on the streets. "Even if a policeman notes down the CRN of a stray animal, which runs away before the arrival of the impounding team, we can trace and penalise the owner as the CRN is linked to the details of owners," said Mehta, who in in charge of veterinary and food hygiene of the Diamond city. Notably, incidents of attack on municipal teams by cattle owners takes place on regular basis in Surat as well as in other cities. Last month, a civic team had to stay put in their vehicle for over an hour when it was allegedly attacked by a mob for impounding a stray cow in the city. According to Mehta, the Aadhaar linked database can also reveal whether the owner is a repeat offender or whether he was involved in such attacks in the past. "We do not release the cattle if the owner is caught for the fourth time. The fine increases with every offence. Since we now know the history of offences, the owners are cautious about not repeating it," said Mehta. According to the official, civic authorities of other major cities, including Ahmedabad and Rajkot, have shown interest in this system and sought details from the SMC.